This section is from the book "Modern Buildings, Their Planning, Construction And Equipment Vol5", by G. A. T. Middleton. Also available from Amazon: Modern Buildings. The New Opera House, Melbourne, designed by the Hon. William Pitt, F.R.V.I.A., and shown in Fig. 220, is one of the most up-to-date theatres in Australia. The new building occupies the site of one of Melbourne's earliest play - houses, which was condemned by the Public Health Department as unsafe in 1900. The theatre occupies a site 66 feet wide by 300 feet deep, and consists of stalls, dress-circle, and gallery, with total seating accommodation for 1800. All entrances are situated in the main street, with escapes at side of building leading to small street at rear. The entrances to stalls from main street lead to a spacious crush-room with all necessary cloak-rooms, etc., attached; from this crush-room two fine marble staircases lead to a spacious lounge adjoining entrance to dress circle, with a fine saloon bar and cloak-rooms off same. The gallery has two entrances from main street. The auditorium has a fine appearance, being roomy and well proportioned. The whole of the architectural treatment has been carried out in Mooresque, which has given the decorative artist full scope for colour, which has been well taken advantage of. The saucer or dome above has been provided with a sliding roof, which gives an unimpeded exit for the heated atmosphere of the theatre, and has proved the greatest boon that theatre-goers have been provided with of late years. It can be said that there is not one bad seat in any portion of the auditorium. The pitch of galleries and stall floors strikes a visitor from other parts of the world as something new; this is the outcome of a complete study of sighting, and adds considerably to the comfort of theatre patrons. The proscenium opening has been provided with a double asbestos fireproof curtain, which is lowered at every performance between acts to ensure proper working if actually required. The stage has a depth of 50 feet by a width of 63 feet, and a height of 60 feet to gridiron floor above; the whole of which is clear working space, enabling large productions to be staged. Two large scene docks are provided, one at back and the other at side of stage; also necessary property-rooms, and a large paint-room with two frames. There is a four-storeyed block of dressing rooms, with all necessary wardrobes and sewing-rooms attached. These dressing-rooms have only one entrance on to stage, with fireproof doors, thereby lessening the risk in case of fire. The large warehouses illustrated in Fig. 221 have an important stone and brick frontage design to one of the principal streets of Melbourne, treated in the Renaissance manner, and have substantially constructed back buildings. The special requirements of the City Building Act have influenced the planning, and required certain subdivision of the spaces. 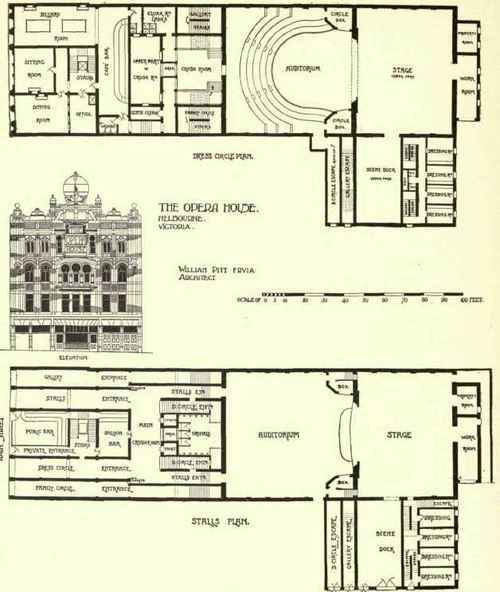 The ground-floor front is planned for the various offices, sample-rooms, etc., and has elaborate wood fittings, the general office occupying the whole of the frontage to main street on the first floor. The warehouses have three great divisions, each served with goods lifts from the side street, which give free access for working. There are five floors in the warehouses, each designed for heavy weight bearing, with steel columns, uprights, etc. A basement extends under the front portion, which has a considerable fall westward. The architect is Mr. D. C. Askew, C.E., F.R.V.I.A. One of the staple industries of Australia, and a largely increasing one, is that of the export of frozen meat. In Queensland and New South Wales the treatment of cattle and sheep has assumed large proportions; while in Victoria the trade is more confined to the export of lambs and sheep, and it is anticipated that with closer settlement and smaller holdings this will be greatly increased. In the northern States of Australia the freezing works are capable of handling large numbers of cattle, and include the treatment of all the bye-products, such as oleo, glue, meat extracts, and artificial blood manures. We give in Fig. 222 a plan of the Imperial Freezing Works, the property of Messrs. W. Anglis & Co., of Footscray, Victoria, which are also arranged as abattoirs for killing and chilling cattle for local consumption. The plan shows the arrangements for yarding cattle and sheep, which are killed on the ground floor (A), hung in well-ventilated rooms (B) to cool, and then transferred on overhead rails to the chilling rooms (C) for delivery to the various butchers' shops belonging to the company. The cattle are killed in crush pens, and hoisted on to the overhead rails for dressing. The sheep are passed along races to the killing pens, and also hung on similar rails. There are also scalding tanks (D) for the treatment of hogs. The sheep and lambs for export walk up inclined roadways (E) to the first-floor killing pens (F), and after being dressed hang in a large louvred building (G) to remove the animal heat; from thence they pass by a system of rails and switches into the freezing chambers (H). After being frozen they are bagged and lowered into the stores (J), ready for delivery into insulated trucks on siding, by which they are conveyed to the wharf for export. The offal passes through pipes to the lower floor, and, together with the refuse from the treatment of local produce, is conveyed by a tramway (K) to the boiling-down works for the production of tallow, the residue being dessicated in a revolving drier (L) to form blood manure. The pelts are dried and baled for export, or sold locally to pelmongery establishments. The freezing and chilling plant consists of two large machines driven by compound engines, and the cold air is distributed through the various freezing chambers and stores by air ducts, the cold air being driven through by means of fans actuated by electric motors. The whole of the works are lighted by electricity, and this power is also used for the various pumps, twists, etc. These works are capable of freezing about 3000 lambs per day, and storing about 40,000, and are considered to be the most complete of their size in existence. Owing to their being built near a centre of population they are of a most substantial character, every precaution has been taken to remove any objectional odours from treatment, and they are perfectly sewered and supplied with water.